For Years, I Was A Bigot. Then I Took A Karate Class. Now I’m A Bigot Who Knows Karate. If you had met me over a year ago, I guarantee that you would not recognize me. Since the day I was born, I was raised to believe that my race made me superior to others, and, without really thinking, I discriminated against anyone who didn’t fit that profile. And while it seemed like I was destined to stay in that mindset forever, I signed up for a karate class, and everything changed. I transformed from a bigot into a bigot who knows karate, and I’m still that man today. Growing up, I’ll admit that I had a lot of misplaced rage and hatred, and much of it went into racial discrimination. When I walked into that martial arts studio for the first time, though, something inside me felt different. The bigot I was inside was suddenly nowhere to be found, and a bigot who had learned how to roundhouse kick had taken his place. Today, though, I see myself as a highly disciplined, highly skilled man who is better than blacks and Asians. Soon, I was not just some racist who had learned karate; I was a stronger, faster racist who had fully immersed himself in the martial arts. I used to have no control over my racism, but karate taught me to embrace my inner core, and then combine my hatred of other races with a thorough knowledge of every pressure point in the body and 22 separate elbow strikes. Suddenly, being a simple, backwards bigot just didn’t make sense anymore—not when I could be a simple, backwards bigot with focus and real fighting skills. Once upon a time, I saw myself as someone who was better than blacks and Asians because of his race. Today, though, I see myself as a highly disciplined, highly skilled man who is better than blacks and Asians. Looking back, I now barely recognize the man who walked into that karate class nearly one year ago. 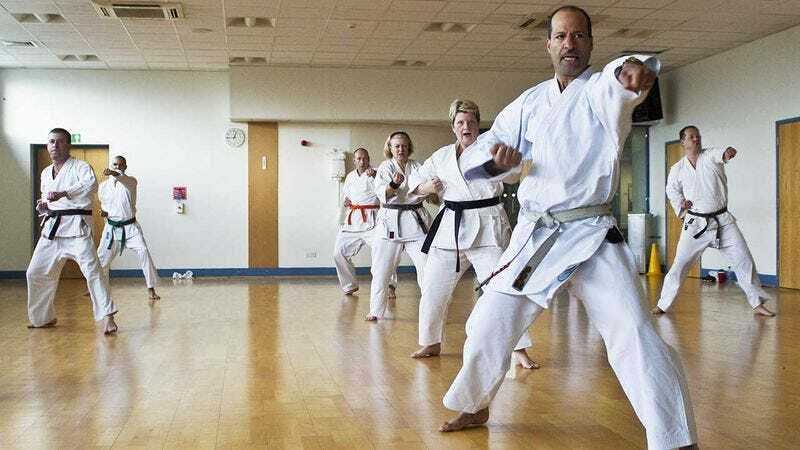 So, if you’re a racist, homophobe, sexist, or even something else, and you’re reading this, I implore you to take even just one karate lesson, and become a racist, homophobe, or sexist who can also break a stack of six wooden blocks. If I can do it, so can you.